Fascination from the neon-lit turquoise lagoon waters, with unending days of exploration through snorkeling and diving. This is the Brilliance of Bora bora! Excitement above the lagoon by outrigger canoe, Boston Whaler, wave runner, Jet Ski, and amazing sunset cruises aboard a catamaran sailboat. Exploration of the panoramic overlooks found by hike or 4×4 accompanied by entertaining local guides. Discovery of the world-renowned shopping for local and international original art, Tahitian pearls, and precious wood handcrafts. Romance in the natural ambience of the legendary resorts with their choice of Polynesian spas, gourmet restaurants, overwater bungalows, villas, and suites. There are so many activities in the world’s most famous lagoon that some visitors never leave the water! The shallow and clear waters allow for snorkeling from you bungalow or off the beaches anywhere around the island. Another way to see the vivid coral and schools of tropical fish is a glass bottom boat. 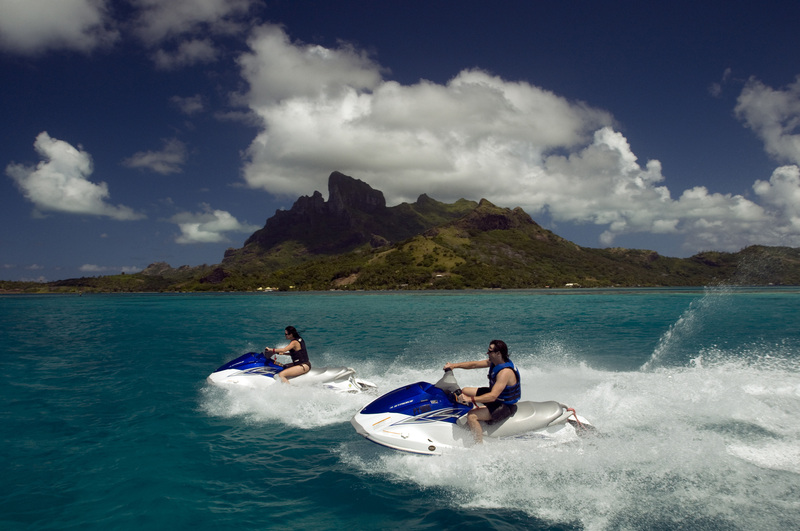 For a faster pace, explore the entire lagoon by rented motorboat or Jet Ski where you and a guide can skim around the island, hopping off at beaches or a tiny motu along the way for a picnic. Start each day with an unforgettable breakfast brought to the private balcony of your overwater bungalow or villa by outrigger canoe. Often bedecked in flowers, the canoe carries Polynesian staff serving fresh fruits, pastries, and juices while the surrounding waters begin welcoming the rising South Pacific sun. Canoe breakfasts are also available at many of the resorts throughout all the islands and can be reserved before you travel by your travel arranger or scheduled with the concierge on your arrival. Even though Bora Bora is small, the adventures along the interior roads are huge. These overgrown forest roads wind high above the lagoon to panoramic stops that can only be described as breathtaking. The island’s role during World War II is expertly told as you visit large U.S. Naval guns left behind in 1945. Although the idea of feeding sharks may sound somewhat ominous, it is now one of the most popular excursions in the South Pacific. Originated on Bora Bora, your close encounter begins after you don a snorkeling mask and float in the shallow lagoon waters behind a secure rope. Docile sharks arrive in schools and are hand-fed by your guide just a few feet away. Later in the same tour, you’ll stand in shallow waters as graceful rays circle the group with ballet-like movements. 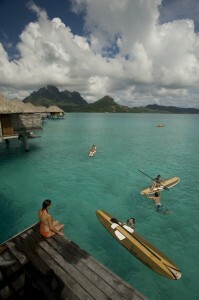 Bora Bora’s lagoon is a very popular anchorage for both round-the-world and avid vacation sailors. If chartering your own sailboat in Raiatea, Tahiti, or Moorea, the deep, wide pass and calm lagoon is a natural stop. You can also rent a Hobie Cat in Bora Bora or take a half-day or sunset cruise around the lagoon on a giant catamaran, complete with music. Because of the abundance of large marine life, diving within the waters of the most beautiful lagoon in the world is on many diver’s “must do” list. During the dives, it is common to be joined by legions of gigantic manta rays gliding gracefully within arm’s reach while schools of reef sharks parade by. Bora Bora is world famous for the surprising number of unique and high-end boutiques and for the quality of dozens of fine restaurants with international cuisine. The ultimate private island escape, Motu Tapu is the most photographed isle in the South Pacific. This tiny motu, just a few hundred yards from the main island, is best described as the world’s most perfect place to relax. Motu Tapu is reserved for guests of select resorts and groups with invitations. Guided or self-guided itineraries including these and other sites can be reserved or planned before you travel or at the activities desk at the resort. Remarkable Honeymoons stands ready to help you with every aspect of your Honeymoon or Romantic Getaway in French Polynesia. We are happy to arrange activities for you whether they are private or with a group.